Made of cotton material, soft, will not hurt the baby skin. Add a chic, fresh touch to your kid's favorite room. Large capacity to give the baby enough spaces to play. Your home with this skid proof carpet gives a comforting room floor with this skid proof carpet. Great for game mat, crawling blanket, stroller blanket, covers in air-conditioned room, multi-functional usage. 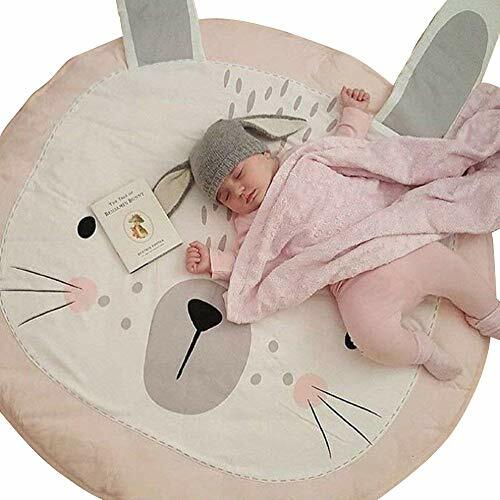 Lovely rabbit animal design, you baby will definitely fall in love to it. Beautiful on the floor in the kids bedroom or play room, a rug that's both stylish and fun. Made of 100% cotton (A thick cotton filling in the middle), soft and comfortable to use, will not hurt the baby skin. Diameter: about 35.43 inch/90cm. Large enough for daily baby activity, unisex for infant boys and girls. If you have any questions about this product by Trycooling, contact us by completing and submitting the form below. If you are looking for a specif part number, please include it with your message.